Among the many accomplishments which punctuated Norbert Szyperski’s life, the founding of ICSI took a special place. It was an acknowledgement of what he had taken away from his year in the US as an Eisenhower Fellow in 1962 and the openness with which he was received in the course of his fellowship. Szyperski was one of the first in the world of German academics to recognize the potential impact of Informatik, the German equivalent of Computer Science and Technology. This led him to introduce relevant aspects of Computer Science into the curriculum of German business schools and thus into the management of major industrial and commercial enterprises. By the late seventies he was probably the most influential academic leading Germany into the digital revolution. In 1981 the German government ask him to take on the direction of the largest research institution devoted to computer science in Germany (GMD); it was a moribund, isolated place with some good scientists, but lacking any direction or signs of management. In that role, Szyperski conceived the idea of an institute in the US, which would allow postdocs and young faculty to be exposed to the ethos of American academic research in CS. The model for this concept was the role played by German medical schools, heavily endowed by American philanthropy before WWII. In 1986, Szyperski enlisted the help of an old friend, a recently retired IBM Research manager. They layed out the plans for what was to become ICSI. Szyperski, single handedly, in addition to his very challenging job at the GMD, sold the idea of a largely German financed, International Institute to the German CS community, to the German government and to the leading industrial organizations. The German CS faculties saw this, as potential funds being diverted to do research in the US. The relevant government agency had no precedent for supporting research abroad. And the large industrial organizations did not see the point of supporting research in a field, which was outside their own technology base. Not to speak of the time and effort which went into this undertaking; there were very few people with the stature, breadth and depth of knowledge, energy and dedication to take on such a task, let alone succeed. Norbert Szyperski was such a person. He has been recognized by the German government with the highest honors for his many varied contributions. They include his role in digital communications as CEO of Mannesmann-Kienzle and the many IT startups which he shepherded into being. Many of his Ph.D. students have assumed leading roles in European society. His ad hoc think tank, “Sylter Runde” has played a trailblazing role in Germany. Everyone who has been associated with ICSI, the Department of EECS, and the University of California are indebted to Norbert Szyperski. 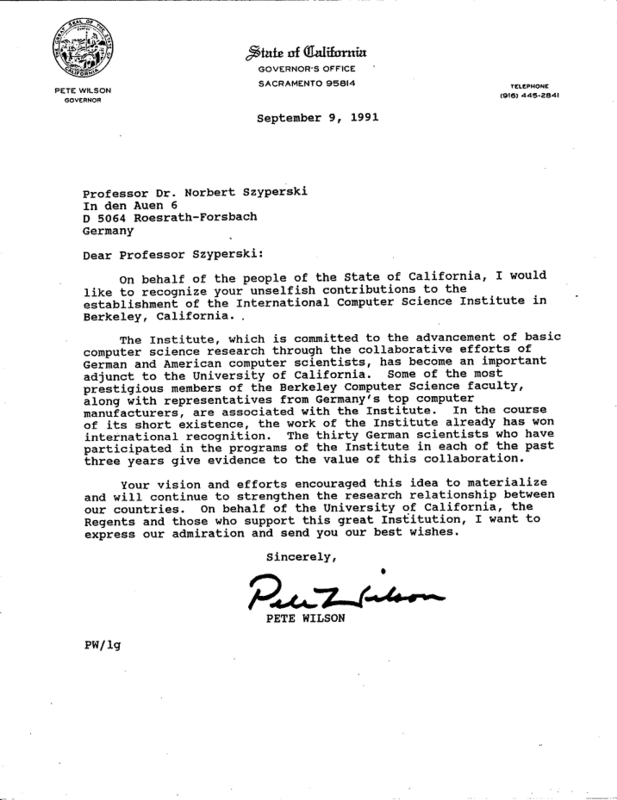 His vision and commitment made possible the outstanding accomplishments which for a quarter century have contributed to Computer Science in Berkeley and to international collaboration. Norbert Szyperski was not only a great man but a wonderful human being; a good friend to those of us who got to know him. What made him exceptional was his talent to see the big picture, think outside the box and his intuitive ability to see others, not in terms of past accomplishments, but their future potential. Ron Kay studied Physics at UC Berkeley and Computer Science at MIT. Upon retirement from IBM Research, he joined Szyperski to bring his experience in the management of research to bear upon the founding of ICSI. He served as Initial Director and on the Board of Trustees of ICSI.